Over the past few years, users were not accustomed to being connected wirelessly. Moreover, wired networks were considered to be more secured as compared to wireless networks. However, with growing awareness, increasing usage of smartphones and tablets in the country coupled with increasing need on the part of the users to connect remotely along with emergence of new standards of technology, India market growth for router and switches in the country seems to be promising. 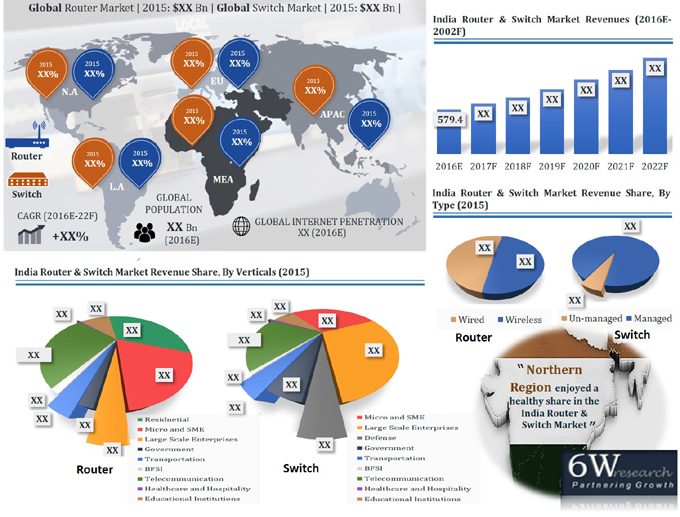 According to 6Wresearch, India router and switch market revenue is estimated to reach $579 million in 2016. India's Router and Switch market is exhibiting growth on the back of increasing usage of internet enabled devices, government initiatives like Digital India, Smart Cities and Make in India, increasing internet penetration, emergence of IoT and increasing adoption of solutions such as social, mobility, analytics and cloud. In the router and switch market, wireless routers accounted for majority of the volume share of the market, while on the other hand in switch market, unmanaged switch segment accounted for the largest share owing to low prices and increasing adoption in small and medium enterprises. Amongst all the end users, enterprise and telecom verticals have captured majority of the revenue share in overall India's router and switch market. In-terms of regions, Northern region captured the largest share of the market followed by South, West and East. The key players in the market include D-Link, TP-Link, NETGEAR, Cisco, HP, Binatone, iBall and others. The report thoroughly covers router and switch market by types, verticals, by regions and competitive landscape. The report provides an unbiased and detailed analysis of the on-going trends, opportunities/ high growth areas, market drivers, India market growth and India market outlook, which would help the stakeholders to decide and align their market strategies according to the current and future market dynamics. 47.2. Binatone Telecommunication Pvt. Ltd.
47.5. NETGEAR Technologies India Pvt. Ltd.
47.7. TP-Link India Pvt. Ltd.